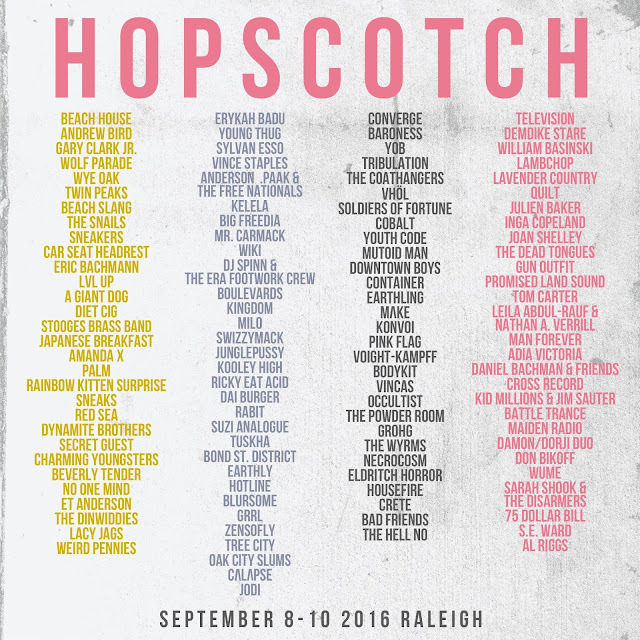 The Triangle Beat: The Hopscotch 2016 Lineup Has Arrived! Hopscotch Music Festival will take place September 8-10 throughout downtown Raleigh. They have released their lineup for 2016 and it's a stunner with acts including Gary Clark Jr., Sylvan Esso, and Erykah Badu. Tickets for VIP and 3-day wristbands go on sale this Thursday, May 12, at 10 A.M. New this year, Hopscotch has added Red Hat Amphitheater to the list of venues in addition to the 3 outdoor City Plaza shows. We'll keep you in the know of Hopscotch details, so stay tuned!